Leather belts are relevant for domestic market and exportation. Among top exported goods leather belts are ranked to be one of the tops. The global market is huge due to the large availability of raw materials to produce the belts. There are many advantages of establishing leather belt manufacturing business, such as low labor cost, government training programs. You get lots of support and encouragement of sales outlets in domestic and international markets. The amount of money you need to start this business solely depends on how big or small your factory is going to be. A small leather belt factory requires very less money. Whereas, a huge factory requires a huge amount. You might consider taking a loan or lend money from your friends or family. 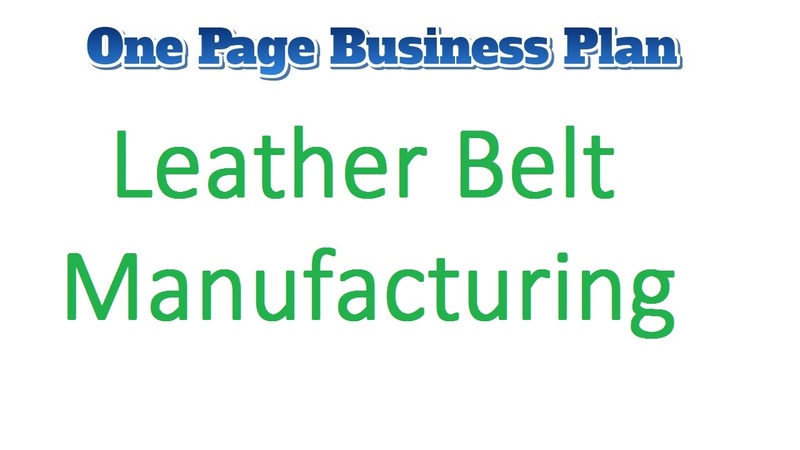 You need to find a space for your leather belt manufacturing business. This could be in an industrial area, or a location that is away from the residential homes. In the same vein, this is not to say that you couldn’t possibly locate your factory in a residential area. It is possible, but it comes with its outcomes – noise. If the residents in your neighborhood have no issue with the noises that your factory is going to produce, then perhaps that is okay. It is relevant that you register your business. This is especially required because you have got to have a properly documented business if you want your customers to cut across private individuals. For this to take place, you would need to register your business at the corporate affairs office or the chamber of commerce office, as the case applies in your country. You have to name your leather belt manufacturing company. This is because there are several belt brands in the market and so you have got to expand yours and have it patented. For example, there are designer belts named after the owners, therefore, be sure to use a unique name that can attract all and sundry. Now that you are getting a hang of things, then you may look to acquire the needed equipment. You will need a variety of equipment to start up your business, some of those equipment include; blank leather, buckles, measuring tapes and industrial measuring rulers, scissors, x-acto blades, hole punching tools or awls, different metal socket wrenches, bolts, and nuts, scraps of marbles or granite, hammers, leather dyes of different colors, paper towels, leather conditioners, neat’s-foot oil, gloves, amongst others. It is crucial that you go for the experienced workers. This is because so that you can get very good finishing. You may think of hiring inexperienced people that you can train, as well as save cost. Although, truth is that you would need to do a whole lot of work. Start producing belts. You can give away some leather belts out to people for free so that you may gain access to the market. If your product is nice and durable, then you can rest assured that you will gather clients real soon. Advertise your factory. This is one of the important parts of the business. Give away fliers and pamphlets to the passers-by and also go and visit potential belt shops and introduce your factory to them. The Internet is also a very good place to get yourself well-known in the industry. Your target markets are basically the shop owners, to whom you are going to supply your belts. You have to keep in mind that you maintain a good relationship with the shop owners so that they choose you as their suppliers as long as the shop is open. You do not need a degree to establish this business. However, you do need have knowledge of how the machines work, how to manufacture the products and so on and so forth. You can work at a factory or you can take courses. The business is a very lucrative business. Once you step into the market you will roll in money in no time soon. Your key to success to this business is, maintaining a good relationship with your clients and producing strong and durable products.